Watching the snowflakes descend slowly from the soft gray clouds filled Arthur with a serenity greatly at odds with the destruction of his beloved city all around him. Looking through the window of the last remaining Stormwatch Tower, he could almost forget for a moment that he was Arthur, Sword Brother and King of the Britons. Instead, he was just a small boy again, looking on as the snowflakes gently fell. The memory was one reason he always looked forward to serving as a Storm Watcher, just as all citizens of his Realm were required to serve, by his own edict. His subjects might have been dismayed to learn that he kept a mental countdown of the days until it was his turn to stand watch for signs of the dreaded Veilstorms. Most of the time, the Stormrider’s poor attempt at humor would have gotten a smile and a sarcastic comment from Arthur as well, but not today. It was time to do what he dreaded most: ascend the stairs up to the top of the tower and remove the last stabilizer. He silently said goodbye to this room and this city, and made his way further up the Stormwatch tower, his friends joining the silent climb he used to love so much. When they reached the tower’s summit, the stabilizer was glowing more brightly than usual. The complicated mechanical device hummed with whirring gears and crystal gyros, an intricate system of articulated metal branches that made it look like a metal tree growing around a sapphire globe. Arthur guessed the shimmering effect was due to the extra effort the stabilizer was making to sustain the land. Grasping the edge of the parapet with razor talons, three fliers waited. Their long, sinuous necks were bent as if in sadness at the collapsing city below. While the drakes were not as intelligent as others of their kind, they had long ago learned to sense the emotions of those around them. Their abilities must be overwhelmed. He thought he saw the beginnings of a tear form at the corner of one flier’s eye, but like the serenity of the City, that was an illusion. They nodded in assent. Six hands and a tail all grasped the last remaining stabilizer. Strangely enough, the stabilizer wouldn’t come free easily. The object was not a living being, but it seemed to fight them, unwilling to uproot from the city. In the end, however, that was just another illusion; with a final tug, the stabilizer pulled out of its base. Arthur could have sworn he heard a sigh when it came loose, but that was probably his own voice. Placing the whirring mechanical tree in a knapsack, he slung it over his back and walked to his flier. As he slid easily onto the saddle in the way he had learned over so many lifetimes, Arthur felt a wave of sadness once again threaten to overwhelm him. He patted his mount’s furry neck, and urged her up into the air. Within moments, he and his friends soared high above the city, watching as the destruction began in earnest. Removing the last stabilizer was like pulling the plug from a bathtub full of water: Buildings that had stood for centuries started to shake as the land began to pull itself apart. Great holes tore open in the earth, and inexorably they began to swallow up the burning city as if they were alive, greedily gobbling up the streets and boulevards. When he could watch no longer, Arthur turned to look at his companions soaring nearby. “No, there is one more thing to do,” the king answered. “And what is that, my love?” asked Gwen. They leaned over empty air as the fliers spread their wings and swooped about in a wide arc, long tails rippling in the wind. 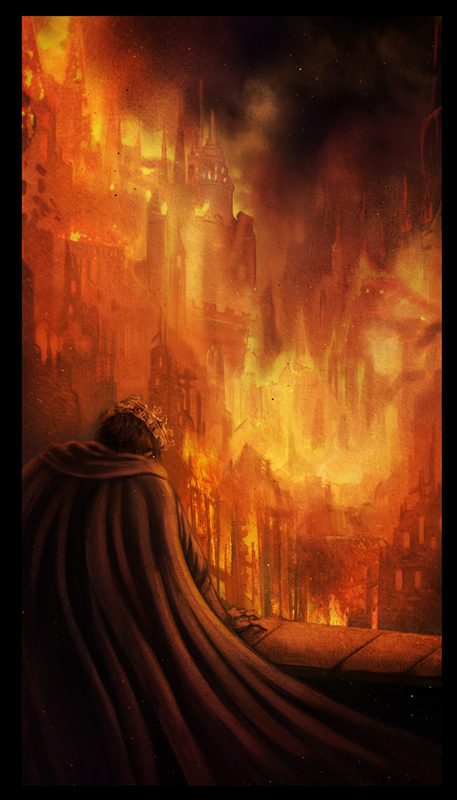 Arthur said his final goodbyes to the City in a whisper, and swore a terrible oath. To this day, only he knows what it was. Arthur, Gwen, and Lance flew off into the sky and turned towards their homeland, settling into their saddles and the rhythm of the wingbeats with grim faces. Perhaps they somehow guessed that not everyone was distressed by the destruction of Camelot. Deep within the bowels of the earth, laughter rumbled and echoed throughout The Depths.